I may have lied to you yesterday. I ranted about how I wasn't going to resolve. I'm participating in Project 365, a picture a day photography project. I'm trying to capture some moments. And possibly become better at taking pictures in the process. Because right now, I stink at photographing anything that breathes. We'll see if that changes. I may post the results every day or every other day or once a week. I'll let my mood dictate the rules. I also make no guarantees regarding quality. Remember what I said about things that move. Plus, some photos may be taken by Konrad and some by Bugs. And they have different skill levels. These candies are one my major food groups. They can be found in three rooms in my house just in case I need to eat my feelings and not walk so far. That's a great photo, Jamie! This is a great idea, I know someone else who's doing this project too. I'll follow your photostream! p-b: First, thank you! You SHOULD give it a whirl. I would love the continued inspiration! Whip out a lens and shoot something before it turns into a pumpkin! That is a great I idea that I may have to get in on also. Maybe I can stick to it this year. I'm baaaack! Got in *just* under the wire. Off to make a new photoset in flickr! p-b: I can't wait to follow your stream! lms: I'm glad we're now connected on flickr! 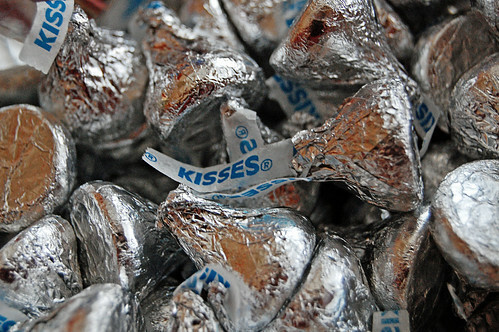 Hershey should buy that pic from you. It makes me want to run out and buy me some. YUM!! !